This review is now updated for the new and improved version of the Fluval Spec V, which phased out the older version around mid 2016. If you purchase a Spec V today, odds are you will get this new version. 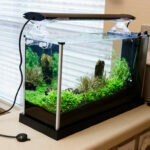 As a quick overview, the Spec V is an all-in-one style of aquarium. This is to say that all necessary components (including light and filter system) are included. Furthermore, the filter and associated pump are enclosed within a special section of the aquarium – it’s truly all-in-one in this respect. The ‘V’ in the nomenclature refers to the tank volume – approximately 5 gallons. The tank is best suited as a freshwater aquarium, although some people have modified the basic version to operate as a saltwater reef. Finnex now makes available a special Marine version of the Spec V. The Spec V makes for a great planted aquarium, even with the stock light (more on that later). I will run through what comes with the Spec V aquarium, describe how it works, give a few tips on setup, present some light performance data, and give some thoughts on the plusses and minuses of this aquarium. I will also discuss some of the differences between the new version of the Spec V and the old (Pre-2016) version. I’ve got another separate page on setting up your Spec aquarium. 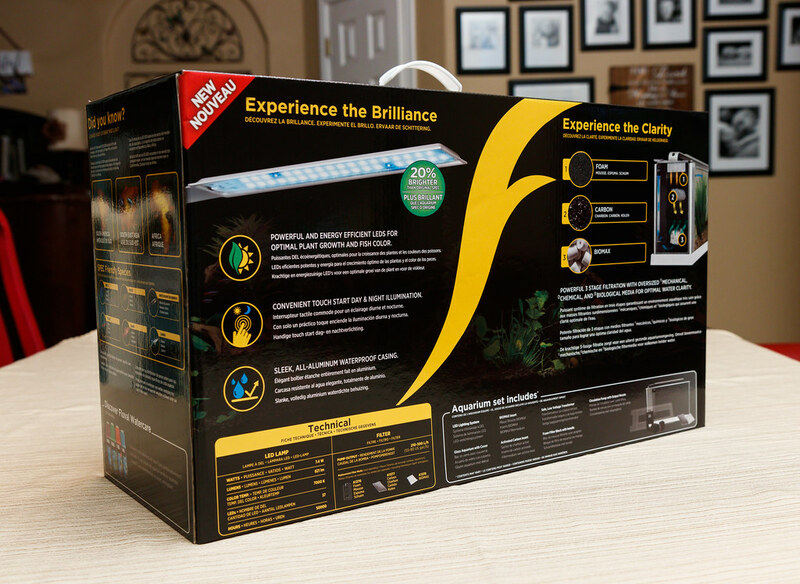 The thing that makes this aquarium so great is that it is an all-in-one configuration where the pump, filtration, and light are housed inside a single package. 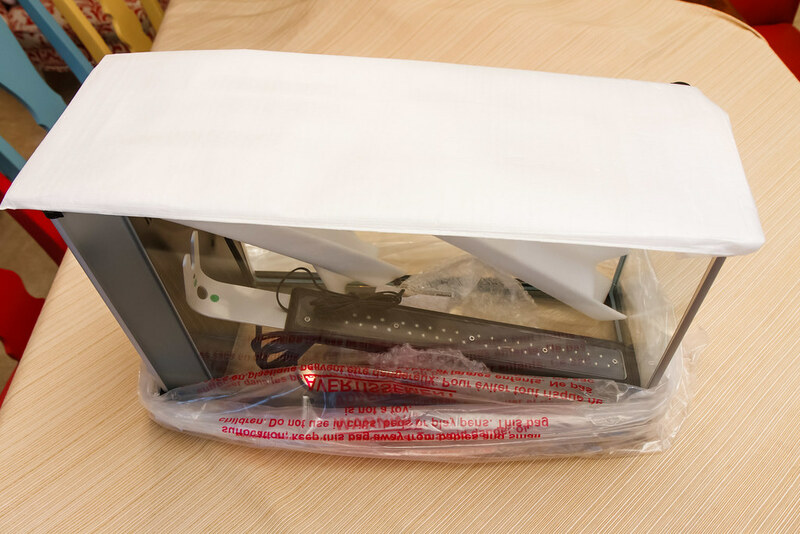 Inside the box you will find the followng: tank, filtration media (consisting of three parts – filtration sponge, carbon filter bag, biomax filter bag), pump, outlet tube, outlet nozzle, aquarium lid, LED light (with associated power brick), acrylic cover, and instructions. 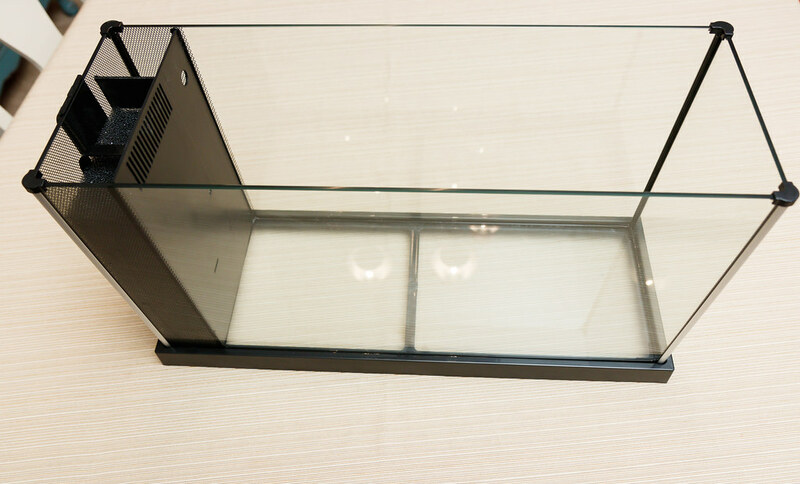 When unpacking, the acrylic cover is tucked in below the aquarium base. 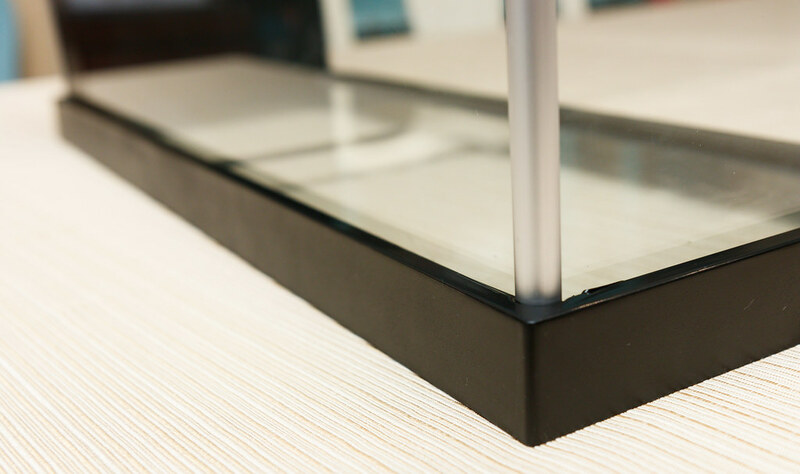 The basic tank construction is enclosed inside four walls of glass (and a glass bottom). Each corner of the aquarium is covered by aluminum quarter round pieces. I initially thought these were a bit clunky looking. However, after years of use I see the brilliance of these corner covers as they hide the algae growth that inevitably creeps in under the edges of silicone joints over time. Even better, fluval now uses black silicone, which helps to hide gunk even better. The top edges corners are covered by a protective plastic piece. 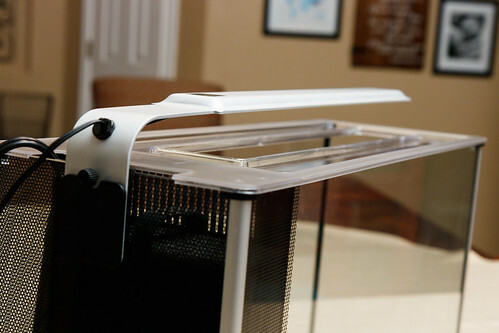 The aquarium sits on a plastic frame. 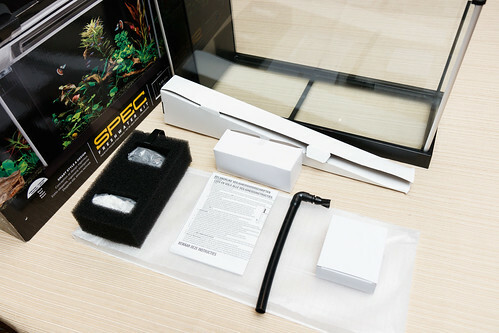 Spec aquariums used to be available in black and white, where the color was for the corner pieces, the bottom frame, and the light. Best I can tell, there is only one version now (with black trim). The aquarium is internally divided into three sections that are separated by black plexiglass baffles. The sections are: main display section (where the fishies live), filter media section, and pump section. 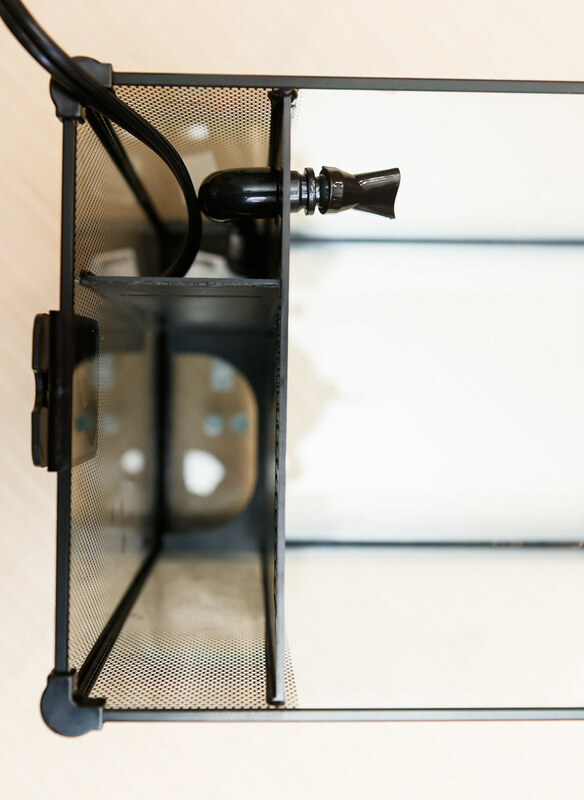 The filter media and pump sections have patterned glass to hide the insides from view – it is a very classy look and keeps the guts of the filtration system hidden. 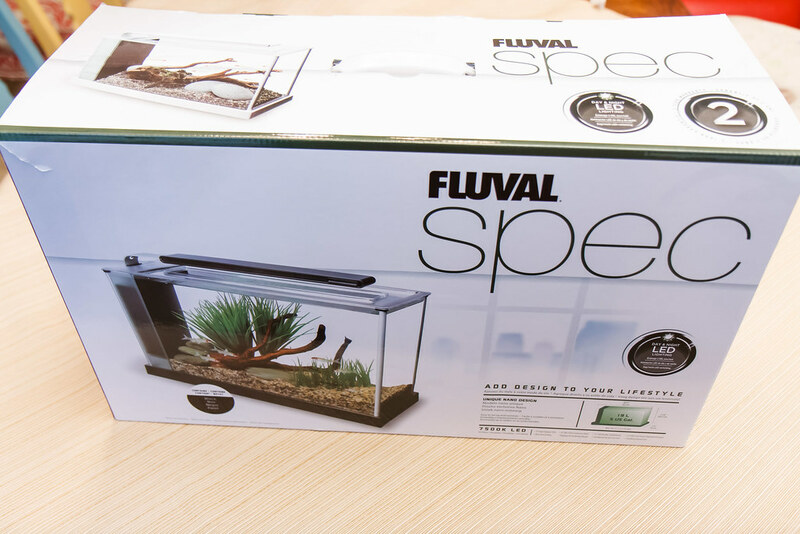 As simple as the Fluval Spec V is, the filtration system is actually very good and mimics the operation of some high end aquariums by using an overflow and trickle-through media compartment. Flow starts at the pump that is located at the bottom of the pump section. Flow from the pump travels up an outlet tube and through the outlet nozzle that is mounted on the tank side of the divider. This outlet nozzle is a ball/socket type of mount that allows you some limited movement to direct the flow where you want. I occasionally move this around to give the critters different flow patterns but usually leave it pointed up and slightly towards the adjacent side glass. Pointing it up helps create some ripples in the water surface to help maximize dissolved oxygen in the water. Water that is forced (by way of the pump) into the main display area then overflows into the filter section through the overflow slots. 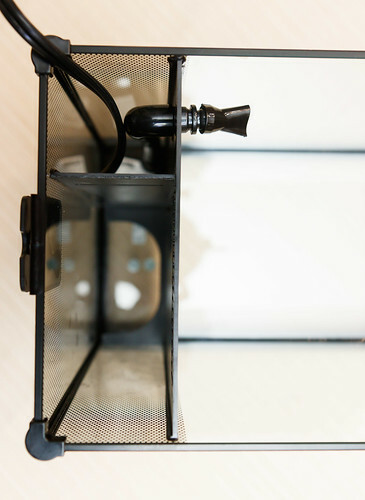 Water then travels downward through the filter media and to a lower section (separated by a partial horizontal baffle that holds the filter sponge off the bottom of the tank). This lower portion of the filter section is open to the bottom of the pump section, which allows water to return to the pump inlet, and the cycle begins again. If you wish to put a heater in your tank, you can either put it into the display area or better yet, some heater models are small enough to fit inside the pump section sharing space with the outlet tube. This is the option that I chose. The instructions were not clear on exactly how to orient the pump at the bottom of the pump section; I found a position that worked best to fit everything in the space. 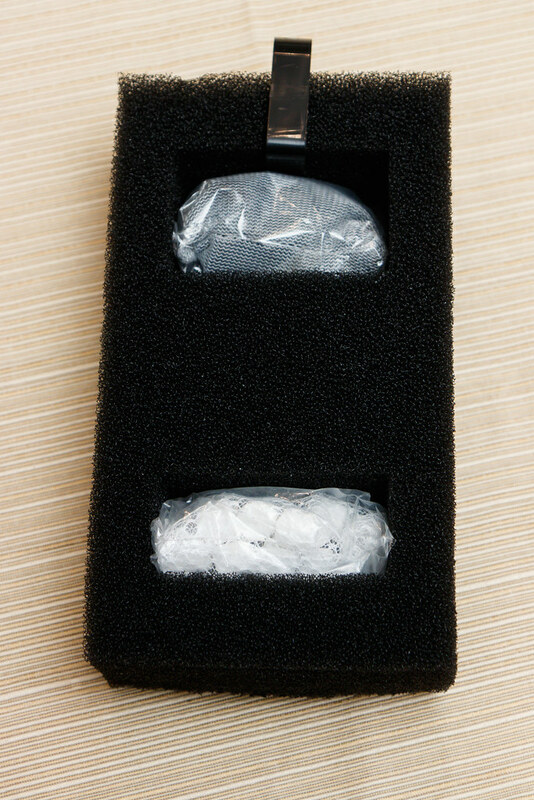 The filtration media that comes with the Spec has three parts: foam block, a bag of ceramic ‘biomax’ rings, and bag of charcoal. The foam block has two openings to house each of the bags of filtration media. Water flown downward through the various media. 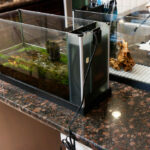 Fluval makes available replacement filter media specifically for the Spec line of aquariums. The filter sponge has a handy plastic handle that helps you remove/replace from the filter section, helpful for performing your regular maintenance. 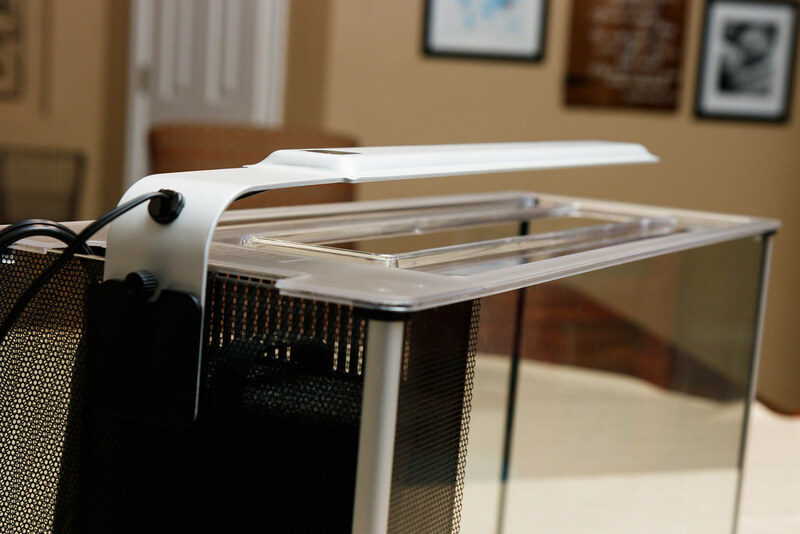 The last two components to talk about are the Plexiglas lid and the light. The lid is a very good design. It is frosted along part of the surface which does a nice job of hiding water spots and hard water deposits over time. The cover does not enclose the entirety of the tank – the middle portion is open to the air. The edge of this center opening has a little lip internally and externally that seems to discourage critters from crawling (snails and red cherry shrimp) or jumping out. 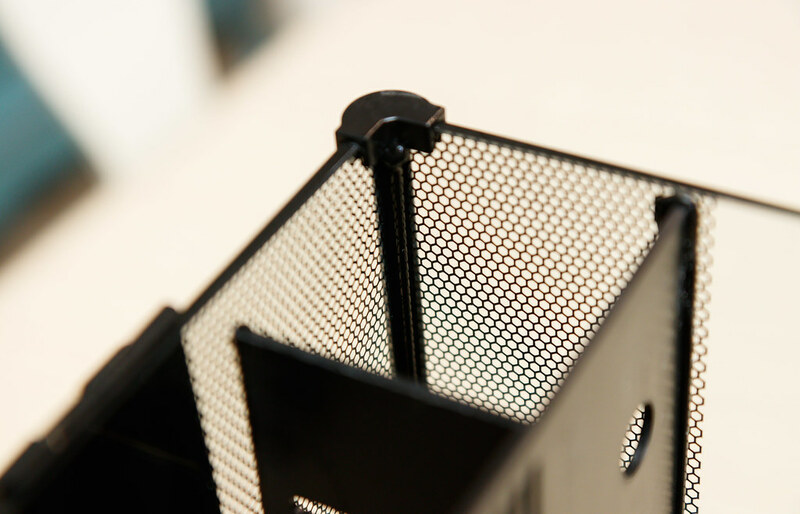 There are four small pegs molded into the bottom that keep the lid centered and fixed to the display tank. There is a small rectangular opening over part of the filter / pump section that allows the cord to exit from the pump. I find this useful for dosing fertilizers or excel right into this section without having to mess with the lid at all and not having to dump things directly at the fish. The light of the updated Spec V is greatly improved over the original version. It is much brighter and does not suffer from light droop. The light has a forked end that slips into a plastic bracket on the end of the tank. The light construction is very unique: The housing is all aluminum and sits very level and sturdy on the aquarium. The housing is tub shaped; the LED lights are arranged inside this tub. What is very unique is that the void of this light is filled with some type of silicone. This was clearly an effort by the manufacturer to make the light as watertight as possible. This silicone material is slightly tacky. It will be interesting to see how it holds up over time, especially with respect to spots and hard water deposits. 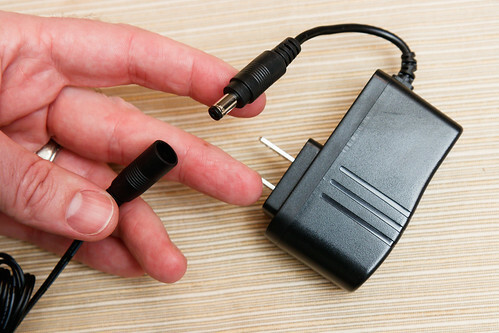 The light has a separate power transformer brick and luckily, also has a cylindrical plug to attach/detach the light cord from the power brick. This is very handy when routing and arranging during tank set-up. 66 PAR in the center. This is actually quite high and makes the stock light suitable for medium light plants and may even be able to raise some high light plants. The light falloff to the corners is minimal and is fairly even. This is very interesting. There is not much light falloff in the center when you go from 5″ depth down to 9.5″ depth. It is still 60 par down where carpeting plants reside. The light falls off more at the lower corners, but at an average of 43 PAR, it is still very good. It seems Fluval has really worked to arrange the LED’s so that the spread and penetration of light is perfect for this tank geometry. I’d say this tank is perfectly suited for medium light plants. You may be able to raise some high light plants with good fertilizers and pressurized CO2 if you can be patient with slowed growth. For some reason, the Seneye meter did not report an accurate Kelvin reading of this fixture. However, if you study the graphs, it indicates a bit of a peak in the blue light frequency range. This matches what I see, which is a slight cool tint. Also note that the light falls off in the red spectrum. Plants grow well with light in the red wavelengths; unfortunately, this light does not produce much in the red range. It’s a great light, but could be perfect if the light produced had more red and was a bit warmer overall. The old light delivers only 11 PAR at the bottom center of the tank. That is barely enough to serve a low light planted tank. I commend Fluval on the efforts they put into the upgraded light fixture. As you can guess, based on me starting a website inspired from this aquarium, I’m very pleased with the Spec V. As great as the original version was, this new and updated version is even better. The tank layout is very good. I love that everything is contained within one package. No separate canister filters or other equipment outside the tank that needs to be hidden. It is very sleek. The filter system works extremely well. Provided you practice a basic standard of maintenance and care, the filter system can handle a reasonable bio-load. I’ve used the same pump for 5 years and it has never skipped a beat. I’m very impressed with the light. It’s construction is very high quality and I suspect that it will hold up very well over time. It is very sleek and vastly improved over the original. The touchpad toggle switch is very nice to use and much more robust than a hard slider switch. I think that this model stands alone as the top all-in-one aquarium. Everything just works, from the filter to the light. The aspect ratio of the display tank gives you a decent space to arrange decorations or plants. The size of the tank is very reasonable and will allow you to place it in a number of locations. While heavy when filled with water, it is not so heavy that it needs an aquarium specific stand; it can be placed on a countertop in your kitchen or you can use a sturdy piece of furniture to hold it up. 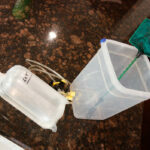 Despite being a nano aquarium, 5 gallons is enough to have some options for what fish and/or inverts you want to keep. I’ve got an entire section on tips for modifying your Spec V. Having said that, I’d be remiss to not mention a few possible tank modifications here as these are easier to accomplish during setup. First, the stock Spec V comes with a bypass slot in the filtration system. You can see it a few inches from the bottom of the tank. It is an alternative path for water to enter the pump. It’s purpose is to keep the tank running if you ever let the water level get too low (below the bottom of the main overflow slots at the top). I feel that this bypass, while useful under some circumstances, is largely a detriment as it allows dirty water to bypass much of the filter. I prefer to close this bypass and force all the return water through the filter media. I have a page here that describes the pros / cons of this modification and gives instructions on how to get it done. It’s much easier to do this on tank setup before you have it full of water and critters. Second, If you want to put a heater in the pump section of your tank, you need to punch some holes in your outlet tube. I go fully into the why and how on this page. 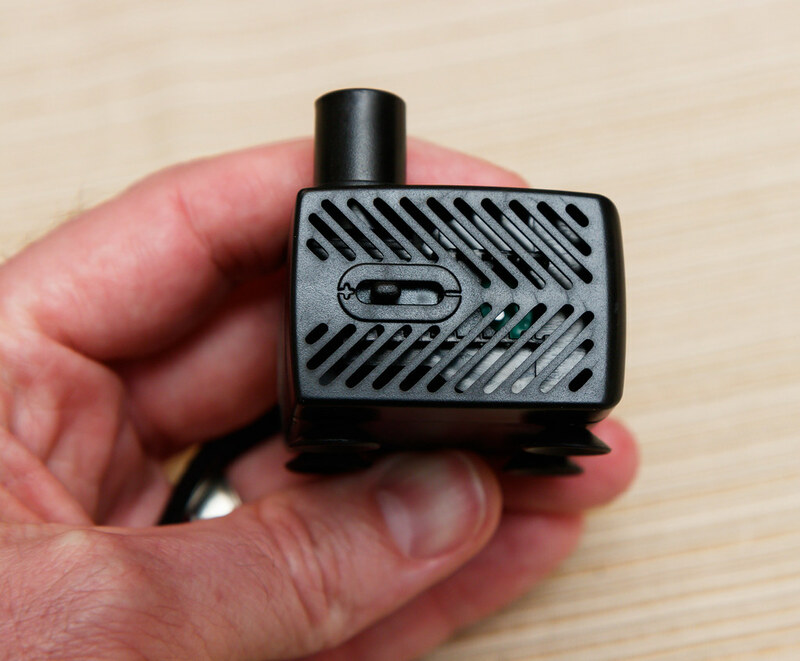 You could perform this mod after the tank is setup; however, I’d suggest doing it right away if you have a heater in the pump section or if you want to lower the outlet flow of your tank a bit. The updated Spec V has tackled the biggest complaint I had with the original version, which was the light. 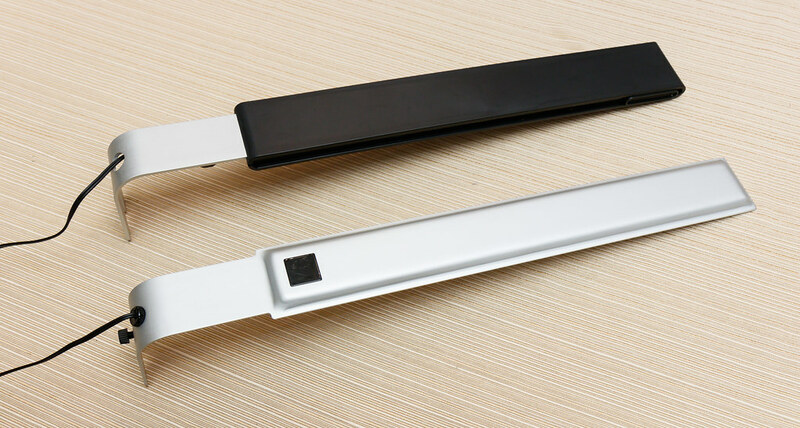 The new light has a design that is much more appealing visually (thinner, doesn’t sag) and has higher light output. The addition of black silicone (instead of clear) was something that I had not thought of, but is a great aid in keeping the tank appearing clean. I’ll cut to the chase. I only see one think that I’m disappointed with, and that is the light color. The intensity is good. The light color is way too blue. This may be a matter of taste – some people might light the blue-ish tint of this light. For most aquariums, especially those with plants, I think a more pleasing and natural look is with a warmer (color temperature) light. I don’t think it would need to be a major change – just a slight shift to a warmer color temperature LED. If I could add to the wishlist, a dimmer would be nice. The light intensity is just what I hoped for; however, for lots of people the light may now be too bright. This could lead to problems for some tanks with increased algae growth. If a dimmer was added you could dial down the light a bit to match the needs and wishes of your setup. I still wish that the pump/filter sections had just a bit more length to make it easier to install the pump and to fit a heater into the pump section. I got it all to fit, but just an extra 5mm or so would have made a difference. The silicone is now black instead of translucent. 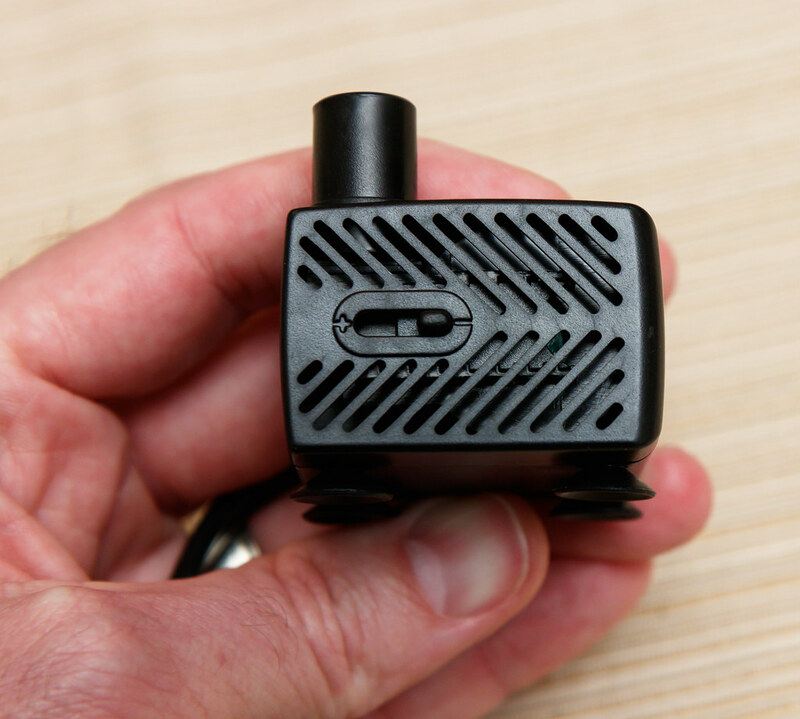 The outlet tube (from the pump to the outlet nozzle) is now black silicone instead of translucent silicone. The pump and filter sections are now obscured by a pattern (small dots) instead of frosted glass. The light is entirely new. It has a much better construction (straight, sturdy, and bright). 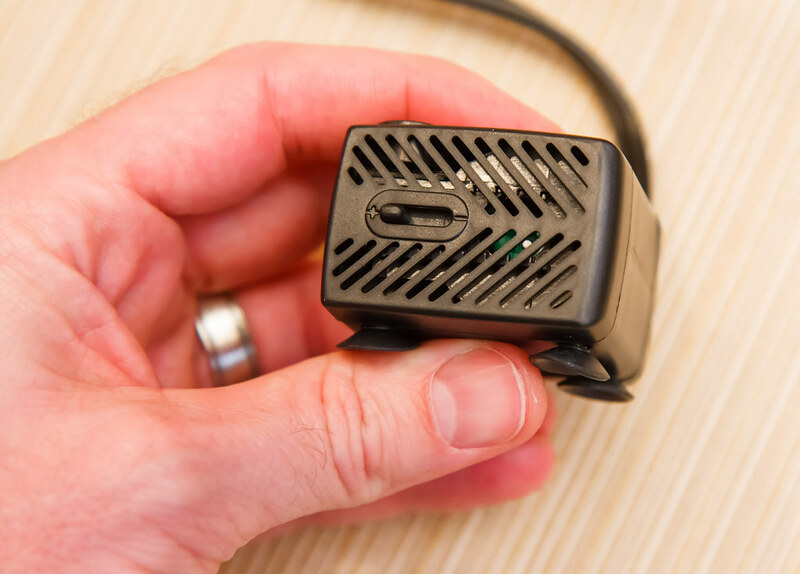 The light power brick is smaller. The cord arrangement is slightly different. The white version of the Spec aquariums is no more, all now come with black trim. That’s about it. I consider all the differences to be positive, except for possibly the light color (it used to be a warmer yellow). 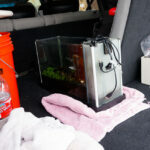 This entry was posted in Product Reviews and tagged aquarium, fluval, nano, review, spec 5, spec v, tank, updated. Bookmark the permalink. To bypass led light screw all together. Get black aquarium filter pad about 6/16th width, cut to fit inside light holder at top where screw would go in. 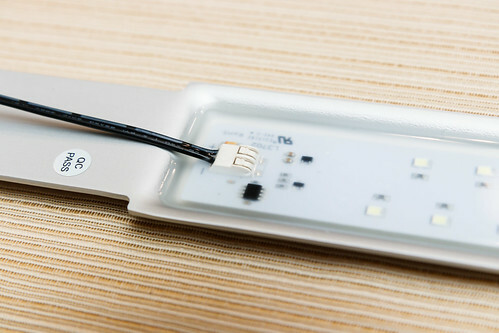 Slide led light into holder with cut pad towards the tank. 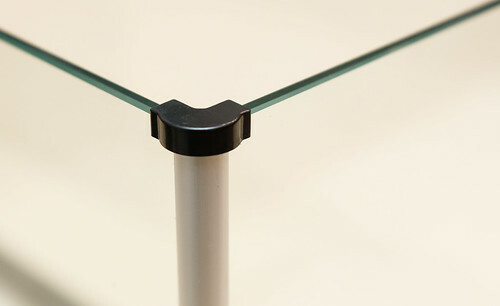 This has braced the light, balanced it and is easy to put in and out. Easily replaced if needed and not noticeable. That’s a great idea for dealing with the light droop problem. I will probably do an entire post for dealing with this issue on the Spec V.
I fixed the drooping light problem with a toothpick. I break it in half and wedge the two pieces between the bracket and metal light holder. This works perfectly and the toothpicks are almost invisible. Just need to use a new toothpick from time to time. Love this tank! 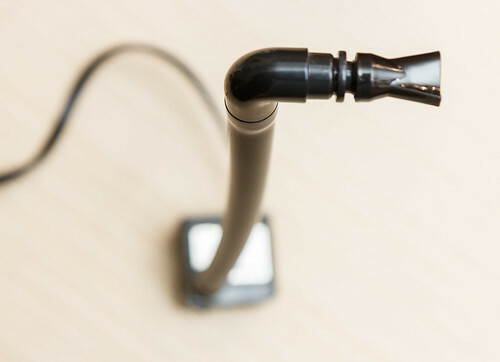 I used your toothpick trick in my page on ways to fix Spec V light droop – thanks! 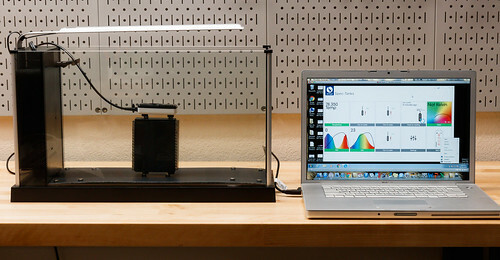 Do you know how much electricity this model uses? I’ re been having trouble finding information on power consumption online. That’s an interesting question! I can’t find published specifications on power draw, but I know only two components with the stock kit draw power; the pump and the light. The pump is tagged with “120v, 60hz, 3.9W”. So 3.9 watts is the power draw all the time – very low! I’m having a hard time finding out the draw of the light. I know it has 35 white LED’s, but I don’t know the wattage each. Let’s say 0.25 watts each. That would be around 9 watts. So the total with the light on would be around 13-15 watts. Add to this a heater if you use one, but know that the heater draw will be intermittent (if it is a thermostat type). .
I’ve contacted Fluval about the lights. If I get an answer, I’ll post it here. Fluval got back to me. 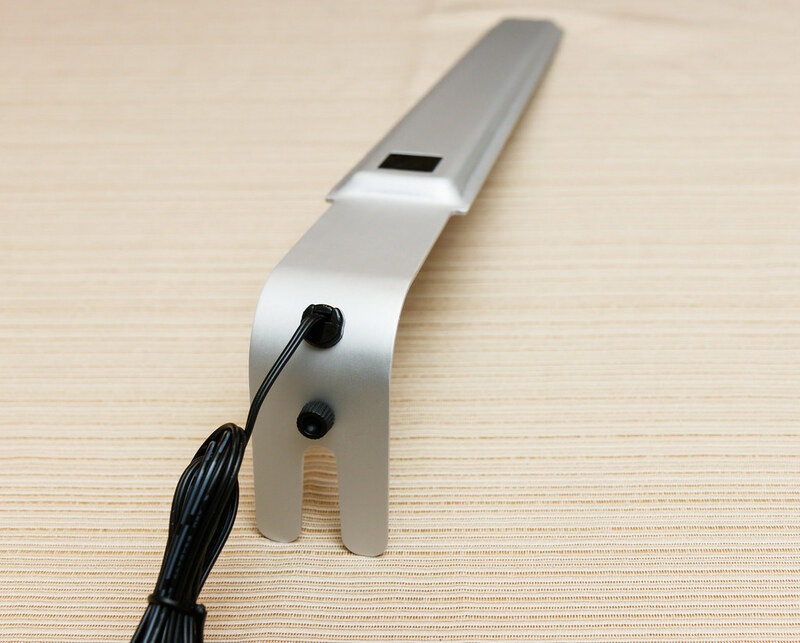 The Spec V lights are rated at 4 watts. I did some running cost calculations using the calculators on three different aquarium sites and came up with an average annual running cost of £15.01. Which I find astonishingly low – a very nice surprise. Lights used for 10 hours per day. The unit cost of electricity in the UK is, on average, 15p per kWh. What would you calculate your expenses to be? Very interesting – the draw they state on the light is even lower than I expected! I don’t think I’m going to do the calculation just now – it’s apparent the power consumption and associated cost is very low. I add to the mix a cooling fan, but it pulls hardly anything. Thanks so much for checking and posting what you found! I had to modify the top because neon tetras did jump out to their death. I used a piece cut from the bottom of a plant tray from the local plant nursery. 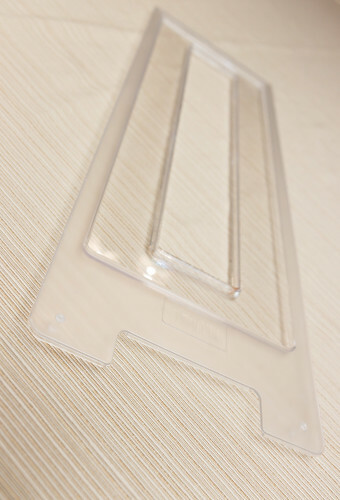 It is rigid plastic with a diamond pattern like on an arbor. It does cut down on the light my plants get but the fish have stayed in so far. I’ve been looking into my first ever fish tank for a long time, having wanted once since childhood (I’m now in my early forties!). I’m also restricted by space so have been attracted to the Fluval range, with the Spec most likely due to its height (I have worktops all around the kitchen where it will go). This is a wonderfully informative page and I will be checking it out often. The light seems to be a common problem on the Spec. Living in England we don’t have suppliers of the Finnex alternatives that are always suggested. 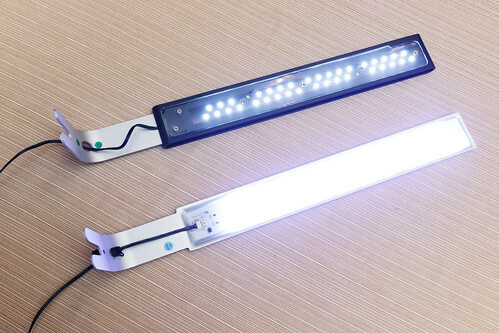 Any UK readers found a decent replacement light more readily available? Thanks again for the informative article! I got my Spec V. I love the look of the tank, but when I filled it with water to try it out, I found the pump runs annoyingly loud. It makes a sound like an old fridge. I tried shaking any air out of it and adjusting the flow rate, but it’s made no difference. In some reviews I’ve read that the pumps can take a while to bed in (the parts wear down). I’ve contacted Fluval, but do you have any suggestions? I haven’t experienced or heard of this. 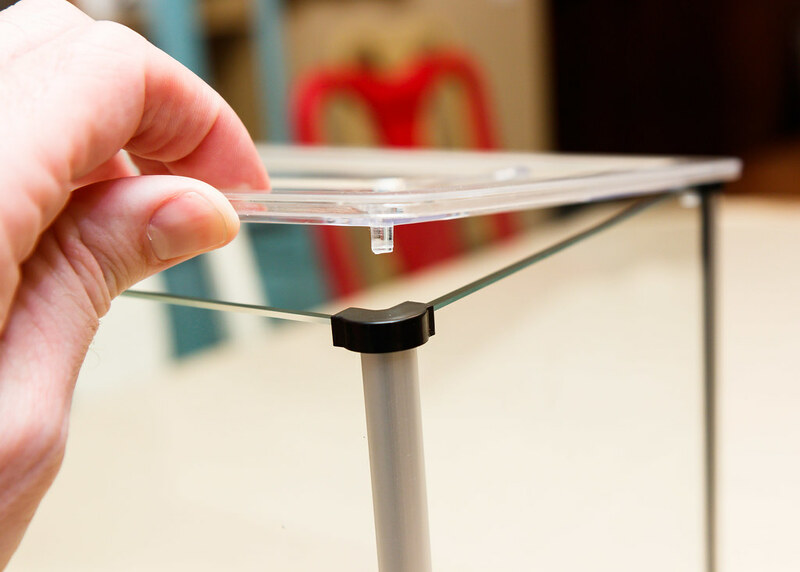 It should not take any time to wear or break in – should work properly right from the start. I can think of only two causes: 1) it’s broken and needs to be replaced. 2) some part of it if vibrating against something. check that the cord isn’t vibrating against the plastic top as it exits. Use a spoon or other long device to scootch the pump around so that it isn’t resting against the edge of the tank or filter wall. That’s all I can think of. Also if you have a heater in the pump area, make sure it isn’t sitting directly on top of the pump as this can cause noise (and the vibration probably doesn’t help the heater thermostat…). Lift if just clear of the pump by about 10mm. Mine makes a bit of a buzzing sound, and seems to make that sound even when I run it in a bucket, but the pump compartment magnifies the sound a bit. I’m used to it now, but it’s certainly far from whisper quiet. Sorry to hear that. Might be something stuck in there making the noise, or it could be a ‘dud’ pump that is just hitting itself or vibrating internally. I can’t understand what you are saying, but sorry about your fish troubles. What do you think of the new upgrades (if you’ve seen them)? Namely, the light is a much sleeker design and WAY brighter from the tests that I have seen. I have the Spec 3 and have no light drooping problems. Just ordered the Spec V so we’ll see how that goes with the new light. Just wanted to know if you have opinions on the new light and it’s ability for planted tanks. Also, does dosing Excel in the filter compartment work? Meaning, will the fertilizer eventually make its way to the display area and actually hit the plants? Thanks! Thanks for bringing the changes to the Spec lineup to my attention. I actually have not seen either the new III (commented on in other pages) or the new V (just hearing now from you). I will hopefully get my hands on the new versions sometime for a closer look. I believe dosing excel in the filter section will work exactly the same as dosing into the display section. We have the older version and also the new. The light is very bright but concerned that may be too bright! We have had a bad algae bloom in the new tank 3 times. Cannot discover the reason and starting to think it’s the light. Our 2tanks are identical set ups except for light; betta, sand, decor and plants! Anyone else experienced this? From what I’ve heard, I would also worry that the new light is too bright for general use (people with no plants or very low light planted setups). I’ll have to think of ways to mod the light to reduce the intensity. I’ve had algae problems with the light as well, even running CO2. I ended up cutting back to just over 6 hours total light a day in a split period. I may creep it up now that things are getting under control with the tank more established and some cleanup crew doing their thing. I also find the color a little “off”, and my red-brown rocks look very washed out under it. I’m way behind with the blog; I’m very interested in getting the stock (new) light tested for PAR intensity. It seems bright. I hope they consider in the future to put in some slightly warmer LED’s. 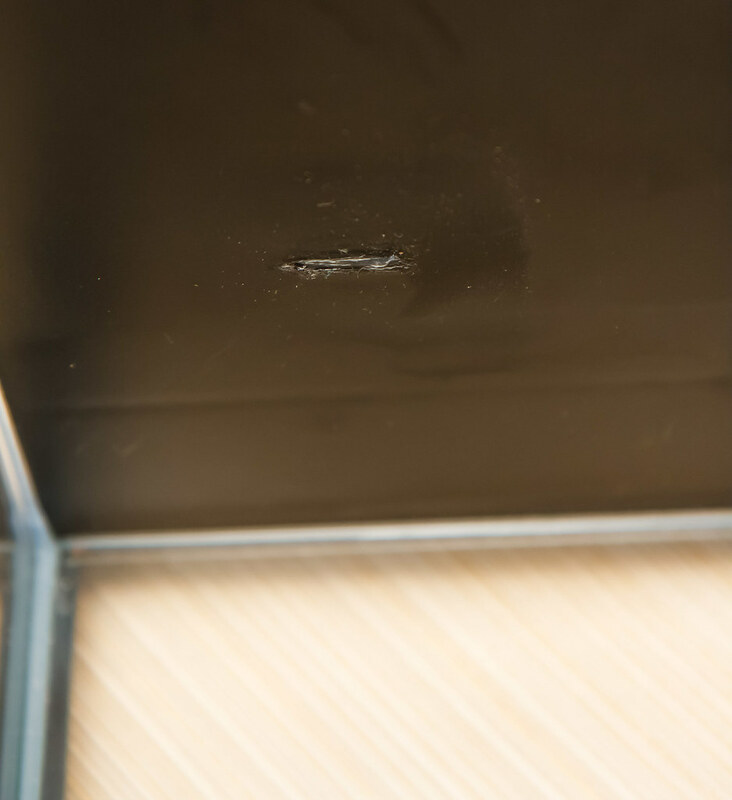 The light has a very easy fix – hold the end up with your finger as you are tightening the screw and it will stay level and not dip! Hi, I am planning to keep a betta in this tank. What wattage of heater do I need. 25 watt or 50 watt usually does the trick. I didn’t notice anything about this but I am very happy with my spec v and love the way it works, I have had it for 3 years and it is wonderful. I have just noticed something else wonderful about it. I now have live bearers in it and the babies love being able to escape from the adults through the slots for the water to go to the filter. They stay in there til they get big enough to safely come out. The only ones unhappy are the adults that don’t get fresh food, but, they love their fluval food. Excellent system. I can’t get my light to work with a timer on the newer Spec V model. Have you had any luck using a timer with yours? I haven’t tried it with a timer yet. What does it do? 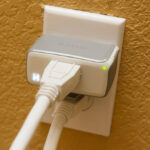 I’m running mine from a WeMo smart outlet to control the on and off times with no trouble. I can’t make use of the “night” setting since that’s on the top switch, but it works fine in terms of setting the light to normal/on then having the smart plug turn it on and off by supplying or cutting power. That’s a great idea. I have three smart plugs that I use to control our Spec V: One for the pump and heater controls, another for the light, and another for the CO2. Love the in-depth review and amazing photos. Like some of the other owners, I ran into issues with the factory light causing algae blooms as well. Interesting – What’s good for some is a detriment to others. A dimmer control (to turn down the intensity a bit) would help. Has anyone noticed the transformer for the light gets rather hot? Within an hour of turning the light on, it gets noticeably warm/hot. I am wondering if it’s just like that and is OK, or whether mine is defective. I am so thankful for your blog. I’ve recently decided to revisit owning a betta. Doing it proper with this tank. I appreciate you. I just purchased this tank on Amazon. The mods looked challenging but after throrough research I can do this. Thanks. Awesome – you are very welcome. Just take things slowly and be patient as you learn. Most of my successes have some with many mistakes along the way. I much prefer the old Spec, I loved the white tanks and clear silicone, along with the stylish light coloured frosting, thankfully they still sell the old version! 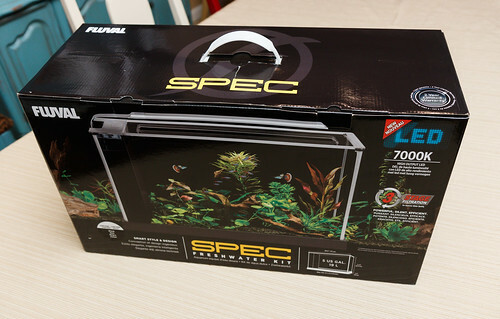 I’ve had my heart set on a Fluval Spec V for some time now and was planning to splash out after Christmas/New Year, but as chance would have it I obtained one via Gumtree (an online classified advertisement and community website here in the UK) a couple of days ago. Although a pre-2016 model, it’s almost as new, having been in storage after the original owner passed and his widow just wanted rid of it. Anyway, having gotten it home, I was browsing online for aquascaping ideas and I discovered your site, dedicated to the Spec series… cue the next few hours spent moving from link to link and reading article/feature after article/feature. I have to say, I’m very impressed with the breadth and detail of the information available, not just regarding the tanks themselves and their components, but also the number of tips, modification ideas and general guides included. So much so in fact, that just as you were inspired to create the site in the first place, so I felt I had to write to congratulate and thank you for it. It struck me that instead of pulling on the power cord to extract the pump (should it ever be necessary/desired to remove it), by linking a couple of cable ties together in series and passing the resultant loop under the pump and between the suckers before installing, I could create a simple handle, similar to that fitted as standard with the filter sponge block. Thanks for the kind words. I haven’t made much progress recently, but I have big changes ahead for our little Spec V in the next few months – rescape and some equipment changes. That tip about the zip ties – very nice! I may just do that myself. Just watched a couple of videos today on Youtube (posted by Pecktec) showing the unboxing / review and aquascaping of a Fluval Spec 16! However, when I try Googling it, or looking for it on various online retailer websites, I can’t find any trace of it. Are you aware of this model, or have any knowledge of it’s availability. I don’t know much about the Spec 16 yet. Thanks for bringing it up. It’s not one we need, but I might get one to review. 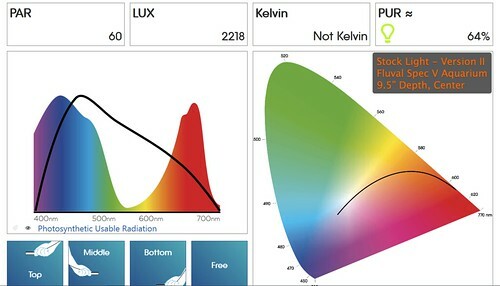 Did you ever use your Seneye monitor to check the PAR of the updated stock light? Myself along with others are really curious about its performance. Please help! I have a silly question – why no air pump for bubbling oxygen into the water? Back 20 years ago, everyone used airstones of some sort, regardless of any filtering. We’ve had our Spec V for a week, and we love it (and so does our betta!). I’m surprised at home quiet it is. And I agree that the light seems a bit too bright and that it should be a warmer color (aside from the blue moonlight). Another silly question – I set the pump on low and covered the outlet nozzle with a prefilter as you recommended for our Betta, but he still seems to prefer hanging out over by the slits and the prefilter – as if he likes the flow. Others have noted this also, which makes me wonder if the premise is correct about the flow being too high for a Betta? I noticed our has laid against the inlet slits, apparently letting the suction hold his fins up, like those Betta hammock leaves. When he swims away, he does so gently, not struggling at all to escape the suction. Also – I hit 1.0 ppm NH3 today so I pulled out the filter block and dropped a bag of Fluval ammonia sorbent into the bottom of the filter box, then I was able to fit the block in on top of it (barely). I presume 0 NH3 would actually be undesirable since I’m still establishing the tank cycle? I figured I check it daily until it hit 0.25 ppm NH3, then remove it until it goes up past 0.5 ppm again. Our water must be hard – can’t get the pH down below 7.6, which I understand worsens the toxicity of the NH3 (?). Hey Nate found your webpage and great resource of information. I’m planning on getting the Fluval Spec V myself and your mods for it are great. 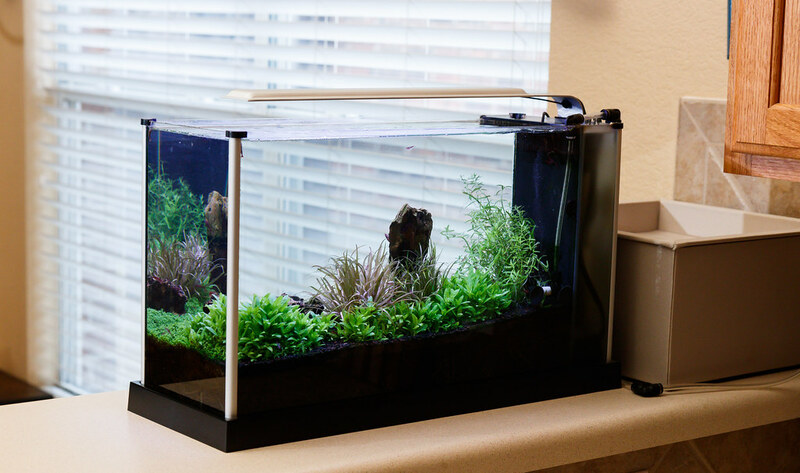 I want to modify my tank with a glass top using tank cover clips. Do you know what the thickness of the glass is for the Fluval? I’ve googled all night and haven’t found an answer. Any help is appreciated. 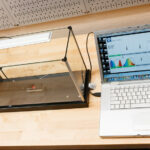 Hey Gene, I just measured with digital calipers. The glass is 3.9mm to 4.0mm by my measurement. 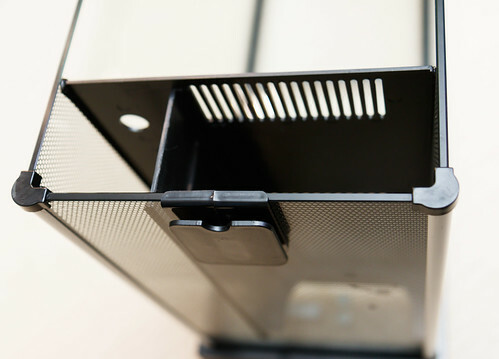 Power cable from heater (in display section) prevents lid from sitting flush. Has anyone else had an issue with this and if so, what solutions have been tried/employed? 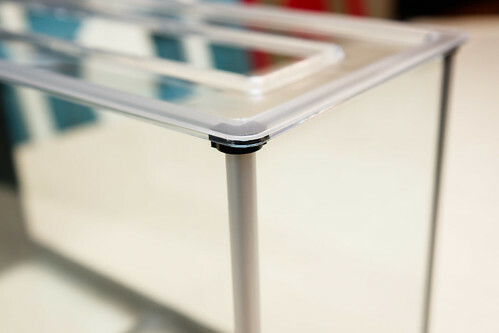 I’m considering cutting/grinding a notch in the interior plastic partition, between the pump and display sections? 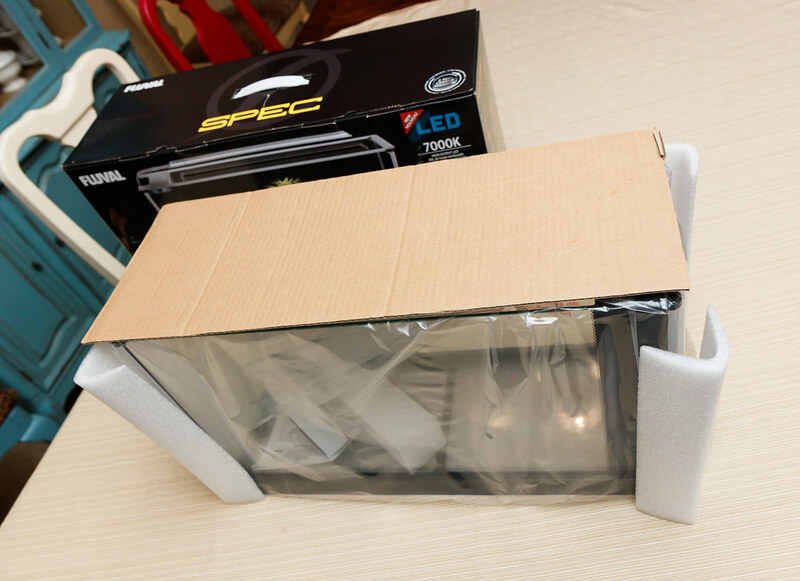 Great site just bought my first spec, it’s setup as a pico reef, it was the new style bought here in the UK, interesting to see the new version is also available in white (which I bought) new light, white honeycomb pattern on filter area and clear silicone. Added intank media basket (floss matting, purigen & Seachem matrix) hydor 25w, inkbird controller and hydor nano wavemaker. Tank has 2kg live rock and thin covering of sand, inhabitants 4 shrimp and soft corals. Can I just ask no one seems to mention evaporation rates how much do you top up just concerned heater is in return area and this is where I would expect levels to fall. John, All the chambers (display, pump, filter media) are connected so evaporation drops them all equally. Evaporation rate varies greatly – Our Spec V probably looses a few quarts a week. I commend you reef guys – good luck! Sounds like a great start. Just bought one a couple of weeks ago and now set up. It’s been 20 years since I had an aquarium – quite into the hobby back in the day with several tanks including a 150 gallon puffer and mono tank. So this is a first foot back into the hobby after many years. First impressions were of nice build and lovely clean looks. The filter system seems OTT but in a good way – over-capacity filtration is a good thing and the tank will be more forgiving of overstocking and/or less than frequent maintenance. Temperature seems to fluctuate al ittle more than I’d like with a small 25 heater in the bump bay and a few holes in the outflow tube. 74-78F over 24 hours is a little excessive but not the end of the world as it’s gradual. I’m still experimenting with settings. I’l like 73-75F for my stock of White Clouds and Neons, + a few small CRS. Those fish don’t really want +76F. I completely blew it on buying wood and rock. Old habits here as I hadn’t grasped just how small the Spec V is, especially with limited depth and ended up with enough hardscape for 3 Specs…….oh well! 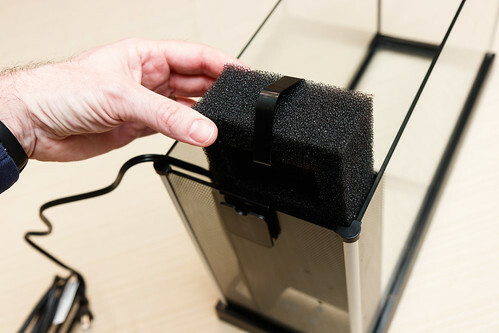 An easy way to make the Spec shrimp and baby fish friendly is to add more sponge to the top of the filter compartment. Just buy a 1″ thick filter sponge, cut so its slightly larger than the compartment area by about 1/4″ then push into place on top of the existing sponge – covers the inlet slots and adds more filtration – win win. Easier than messing with mesh or gluing things into place. also plug the slot at the bottom of the divider. For the £80 delivered this cost it represents great value. Great thoughts Rob. Why didn’t I think about that! Nobody needs the blue ‘night mode’ but a low light option with about half of the white LED’s energized would be super useful for those that don’t have plants and/or don’t want algae.